The week has just started but I feel like I’m getting ready for the weekend again. I have the next 2 days off from work to go on a fun road trip 🙂 Well, it will be fun once we get to our destination. During my gym session this morning, I actually noticed the improvement I’ve made doing my HIIT workout. The last few weeks I have consistently worked on interval training, and I love that I get a quick workout in a shorter amount of time. My current workout schedule is 6 days a week. I do a combination of HIIT workouts on the treadmill, running outside, Body Pump classes and lower/upper body strength training. I went to work early this morning so I made a breakfast that I can wrap and eat at my desk. Easy as 1, 2, 3. I sprayed the pan with olive oil, then added the veggies. Stir until they are slightly wilted. 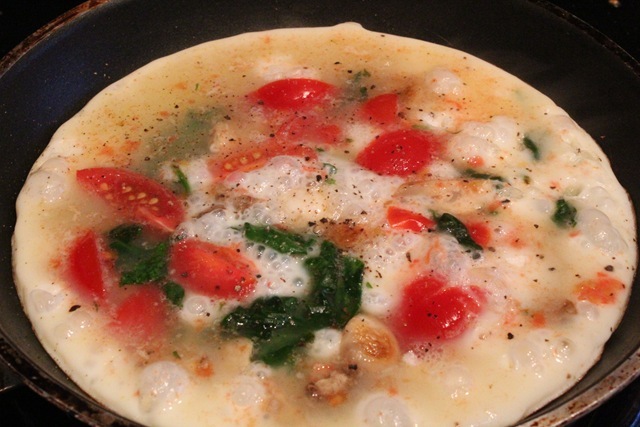 Add 1/2 cup egg white. 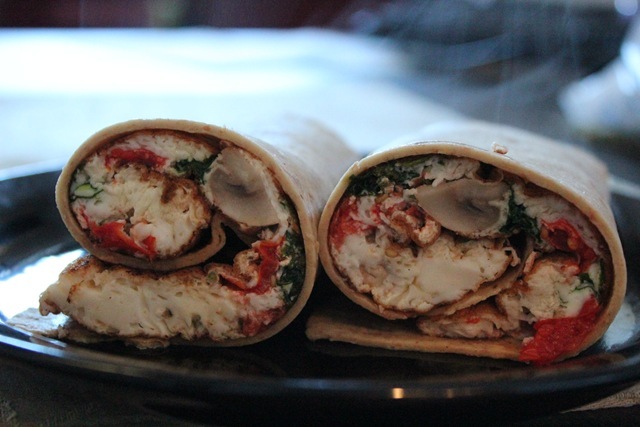 Once cooked, wrap in whole wheat tortilla. 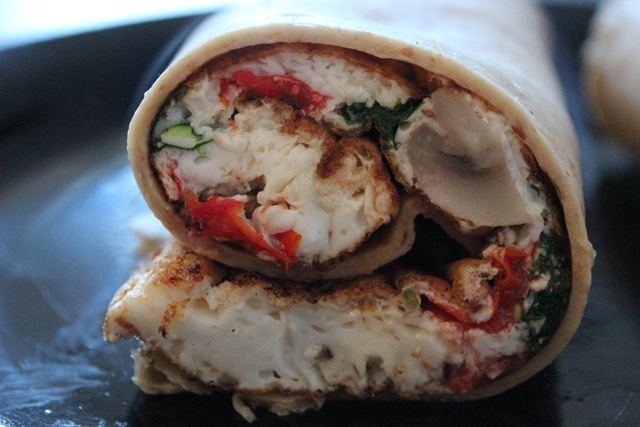 It taste great to with cheese melted inside the wrap. One of my favorite protein-packed breakfast on the go. 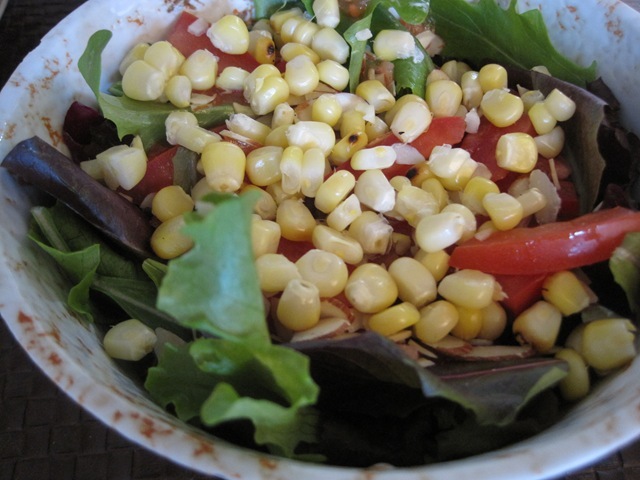 Lunch was a huge bowl of salad with veggies but the fresh roasted corn stole the show. I also ate a small bowl of Moroccan couscous on the side. 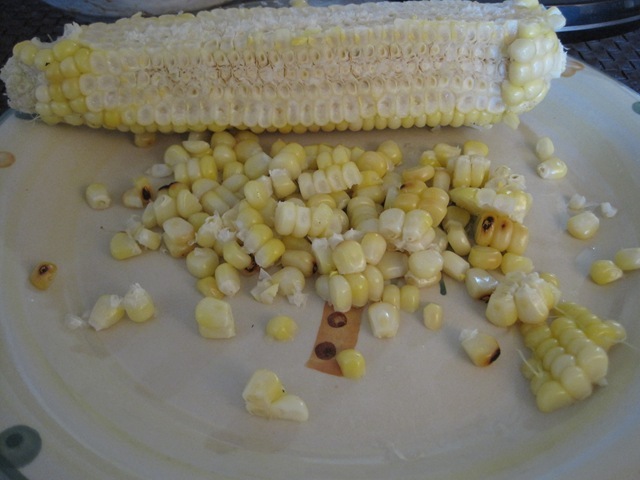 Fresh corn always trumps frozen or canned corn. Don’t you agree? My mid-day snacks usually consist of fruits + another item. 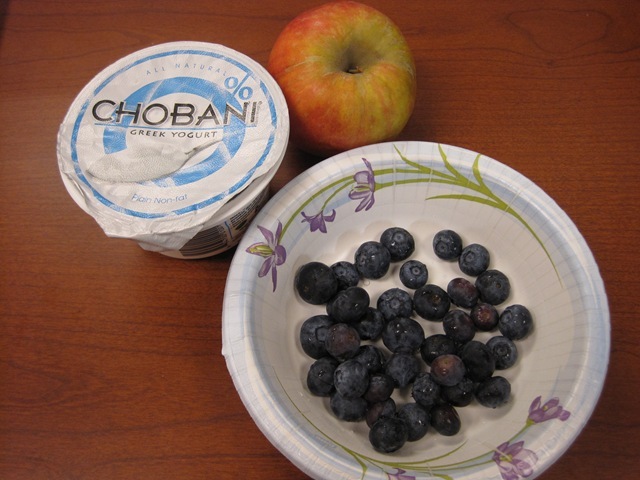 Today I had blueberries + apple with plain Chobani and a sprinkle of granola (added after the picture was taken). After dinner I baked some muffins. I noticed that my sister always buys muffins from the grocery store. She loves taking them to work during her early shifts in the morning. I read the ingredients on the package and offered to make her healthier version. I made a batch for her and also a batch to eat for breakfast since we are leaving early tomorrow for our road trip. This recipe was adapted from here. I love the sweetness that comes from the banana and the burst of blueberry flavors. Preheat oven to 400°F. Line 12 muffin cups with paper liners. Combine flour, sugar, oat bran, baking powder, and salt in medium bowl; whisk to blend. This is a breakfast or afternoon snack muffin. It’s slightly sweet so if you want to make it sweeter if making for dessert, just add more sugar. 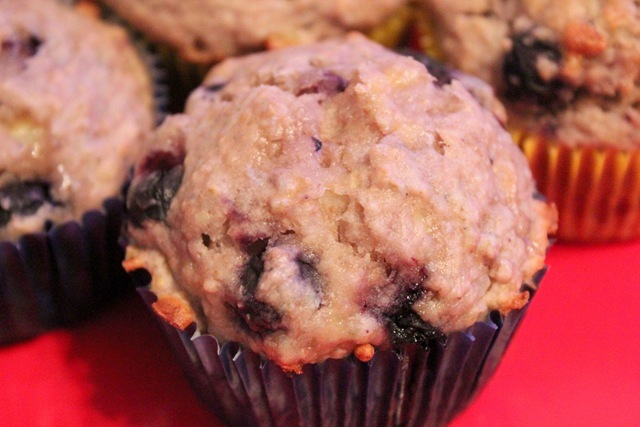 definitely just book marked this muffin recipe. 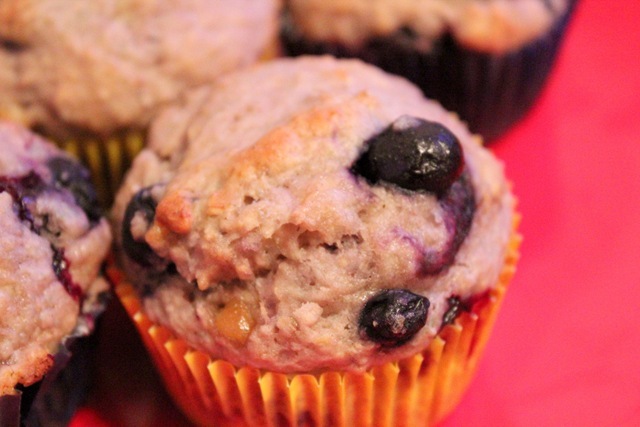 i always crave blueberry muffins and this is just perfect! 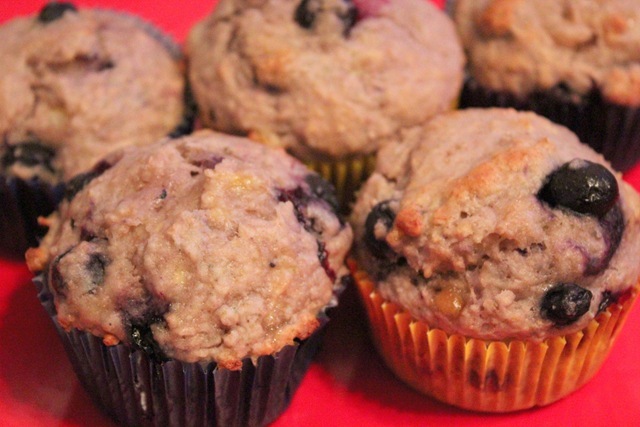 Banana and blueberry muffins sounds delicious! I’m not a big fan of just egg whites because I really like the yolk hehe but this breakfast burrito looks so good, I won’t be able to say no to it! that bfast wrap looks amazing, and so do those muffins!!!! I absolutely love fresh corn and I’ve been eating it raw in this Raw Avocado Corn Salsa, it’s still sweet. I heard I can make it with Silken Tofu use the same veggies just bake it like a frittata and place in a wrap I have to see. Hope you have a total blast on your road trip! I am road tripping too- but its for work…which isn’t nearly as much fun. Now that is a GORGEOUS and healthy breakfast. And I love that you made your sister muffins. 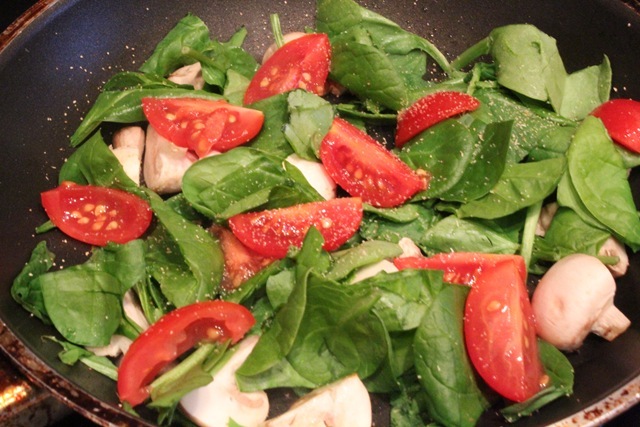 Its always awesome to show others how easy it is to make healthier versions of foods at home. Hey Lea! The muffins look awesome. And 6 days a week… wow. I’m so impressed. It makes me feel so lazy! Anyways, I’m back from the Philippines now. I had SO much fun! Thanks for the tip about toilet paper ;] I always had a stash in my purse. copied and pasted! 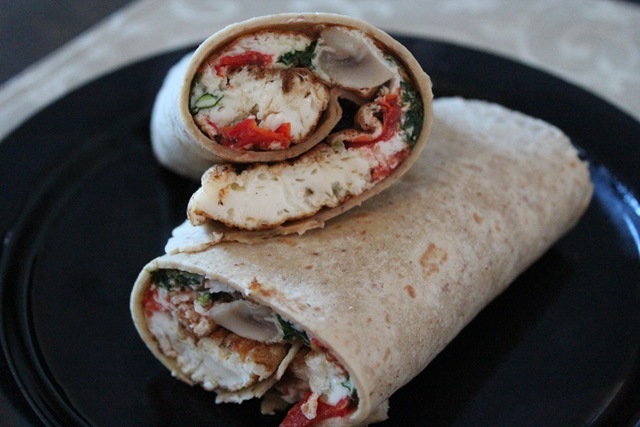 I”m making this wrap! 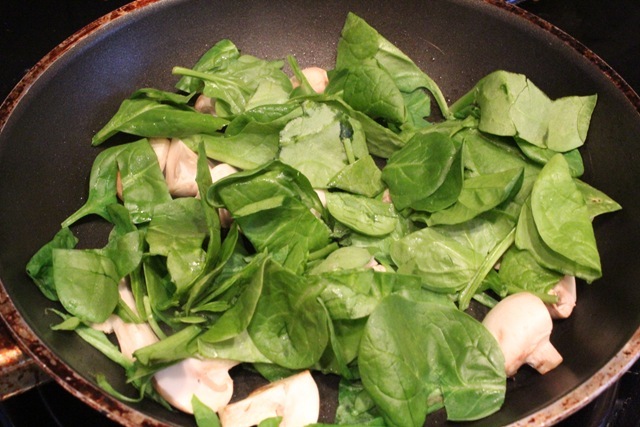 Not tonight because dang if I don’t have any spinach but it’s happening ASAP – thanks for posting! That wrap looks delicious. It might be enough to get me to buy some tortillas. Looks very yummy! I’m going to try the recipe this weekend! YUMMY to everything! I hope you have fun on your trip! ..We like our muffins absolutely popping with blueberries and we found that we like also them best in mini size – youre guaranteed to get lots of blueberries in every bite with a one-bite muffin. ……….Mini Blueberry Lemon Muffins.about 3 dozen mini muffins..2 1 2 cups flour .3 4 cup light brown sugar.2 teaspoons baking powder .1 2 teaspoon salt.1 tablespoon finely grated lemon rind from about 2 small lemons squeeze for juice as well .Juice from the two lemons.1 1 4 cup milk .1 2 cup oil.1 egg.1 pint bluberries..Heat oven to 350F and line a mini-muffin tin with paper liners or grease each cup.